Rafiqul Islam does not have his land anymore, but he lives a more settled life. He owned land on a river island of the Chilmari Upazila in Kurigram district of Bangladesh that was prone to severe flooding. His land is now entirely submerged. Earlier, migration was the only option, but it crippled the people financially. All their effort would be directed towards the rebuilding of houses which were at the constant risk of being submerged. Household assets like cattle, poultry and goats would also be affected. Islam explained that he was forced to either sell them at very cheap prices or leave them behind. Islam and his family have moved at least 15 times in the course of their lives to survive the floods. Frequent flooding in the region, sometimes thrice a year, posed an undefeatable challenge. But life for the family has now stabilised. 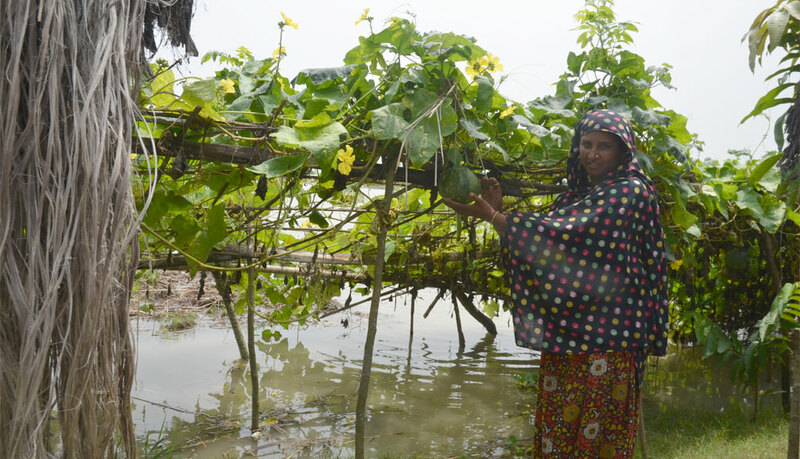 The height of the river island (char) which they live on was raised under an internationally-funded initiative called the Chars Livelihoods Programme (CLP), which works with people living in low-lying char areas in Brahmputra and Jamuna rivers of Bangladesh. The plinths of at least 116,500 households have been raised under the programme since 2004. Major districts where the programme has been implemented are Kurigram, Tangail, Jamalpur, Rangpur, Lamonirhat, Sirajganj, Nilphamari, Bogra, Gaibandha and Pabna. While many interventions to protect these islands have been implemented in the past, the new plinth-raising technique has been devised using research data that makes it more secure. Plinths are build by bringing soil from other places and using it to increase the height of the inhabited area. A staircase-like structure (ghat) around the cluster is developed. These ghats enable villagers to grow grass to prevent soil erosion and also to sow water vegetables and other crops. “We conducted community risk assessment before designing the method,” says Mamunur Rashid of Rangpur Dinajpur Rural Service (RDRS), a local non-profit which is part of the programme. RDRS conducted a survey to know the maximum level of floods. The height and design of the plinth was decided based on the community’s inputs and experience. M G Neogi, a consultant with the World Bank, says that the base is raised to 60 centimetres above the highest known flood level. The households are also linked to evacuation roads in case floods exceed the maximum level, allowing for the movement of families and livestock. “The best time for raising the homestead in northwestern Bangladesh is between November and April as it is easy to get adequate soil during this period. Soil is available readily and free of cost in chars or the river islands and other remote areas,” explains Mamunur. Hence, the only requirement is labour that is needed to bring soil from adjacent areas. Apart from raising the height of the cluster, bamboo structures are also added around the ghats, to support crops. Houses made by locals using jute sticks and straw are vulnerable to rain. The non-profit provides four to six cement or steel pillars to add strength to these structures. Along with the homestead-raising, other facilities like borewell, community latrines and support to produce vegetables are provided. A mechanism is derived to select the people or location where intervention is necessary. Areas where most of the houses are regularly inundated during the monsoon are given preference. The cluster is finalised after consultation with local government agencies such as Upzila Parishads (councils) and Union Disaster Management Committees (UDMCs). A beneficiary of RDRS project in Chilmari Upazila in Kurigram, Sultan Mahmood is relieved as his house is safe from floods this year. "Earlier people were forced to live in inhuman conditions when they migrated because locals always resisted and did not welcome others," he said. It costs US $200 to raise the plinth of one house (a single room). “We are working on minimising the cost. So, we decided to work on a cluster basis. It decreases the cost of construction. If people go with this new idea, US $150 will be enough,” said Mamunur. Earlier, all costs were borne by external parties like donors. The contribution of island residents has now risen to 10 per cent of the total cost, which is generally in the form of labour. Some spillover effect is also being observed. People are now seen following this idea and making joint efforts, instead of raising individual rooms and houses. The practice has become common in the Teesta water basin in the region.